In my journey to Hat #3, I learned so many things. 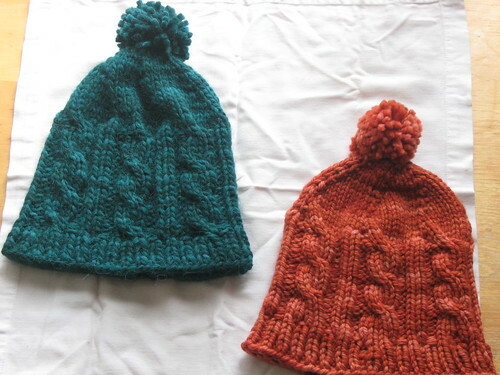 The blue hat and the orange hat were both knit in Malabrigo Chunky. 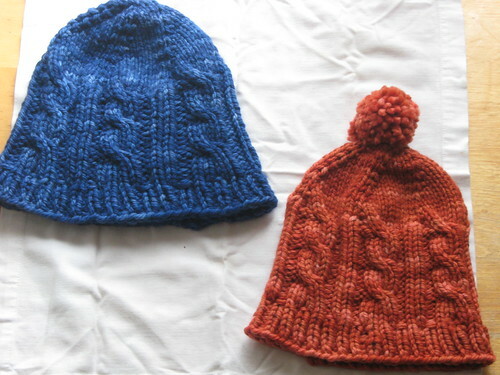 Difference: Blue Hat was knit on size 11 needles at about 3.25 stitches to the inch; Orange Hat was knit on size 10.5 needles at 3.75 stitches to the inch. Orange Hat is the perfect miscellaneous baby-size; Blue Hat fits my ridiculously large head and is even too big for my 8-year-old. 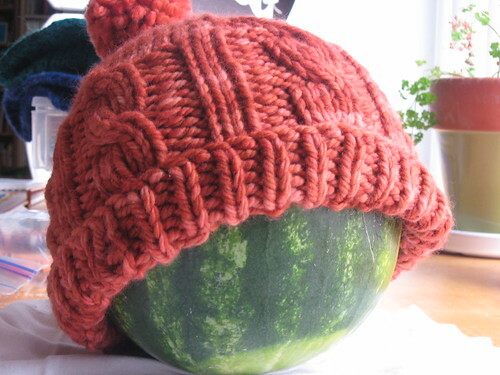 The green hat is knit from ShiBui Knits Highland Wool Alpaca, a single-ply alpaca. The orange hat is Malabrigo Chunky, a three-ply merino. The hats both stretched to a similar size. Orange Hat’s stockinette portion is more elastic, “bouncing back” better after being stretched. Orange Hat’s cables are also better-defined, and hold their shape better. It’s not a value judgment — the hats just look different. As a matter of taste, I prefer Orange Hat. For hat #4 (!) I’ll use more Malabrigo Chunky. As someone who tends to snap up a skein of Malabrigo Chunky at a time, hoarding the individual colors just because they are pretty, this pattern is a FAT stashbuster. I had forgotten I had this much m.Chunky. I need to get back to my regularly-scheduled knitting, but I have been enjoying these 48-hour projects. There are more babies out there who (will eventually) need hats, so I’ll probably make two more Fierce Hats before taking a sweater break.